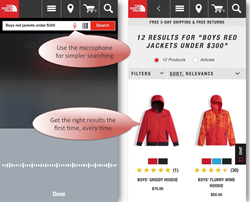 The North Face has launched one of the first Mobile Voice-enabled eCommerce apps for the iPhone, with search powered by EasyAsk's natural language site search engine. The North Face, a VF Company, has launched one of the very first Mobile Voice-enabled ecommerce apps for the iPhone. Using Apple’s Siri embedded microphone and voice enabled technology; shoppers can simply touch the microphone within the search box and say their ecommerce search. EasyAsk provides the artificial intelligence (AI) behind the scenes to understand the context of the search questions, as well as the content of The North Face’s product catalogue. The results are breathtaking. Absolutely perfect search results based on whatever the shopper wants. As most ecommerce searches begin on Smartphones, this dramatically improved User Experience is expected to drive significantly higher revenues and customer conversion. The North Face’s ecommerce solution is built upon IBM’s WebSphere Commerce platform, leader in Gartner’s Digital Commerce Platform Magic Quadrant, combining comprehensive delivery of merchandising results and shopping cart checkout. EasyAsk, the leader in intelligent, intuitive search, provides the Search and Merchandising technology that drives merchandising programs: cross-sells, up-sells, banner management, as well as fine control over product ordering. Built upon an evolutionary AI and Natural Language platform, EasyAsk provides intelligent search on any device: desktop, laptop, tablet or even SmartPhone utilizing the latest Mobile Voice User Experience. In benchmarks comparing EasyAsk to The North Face’s older keyword search engine, SOLR, EasyAsk’s Natural Language solution drove significantly more revenue, averaging between 23-70% all within 90 days. “Our sales per search session increased by 23% when we added EasyAsk to our WebSphere platform,” said Cal Bouchard, Sr. Director of eCommerce at The North Face. EasyAsk is a verified partner in the IBM WebSphere Commerce Partner Program and Gartner’s Cool Vendor in Search. EasyAsk integrates with and enhances your existing eCommerce site by providing an intuitive User Experience that lets shoppers simply ask for what they need and get the results they want.